This time of year, everyone is getting into the holiday spirit – including our guest artists! These talented folks are the pens behind our Munchkin Guest Artist Edition line, celebrating the 15th anniversary of Munchkin. 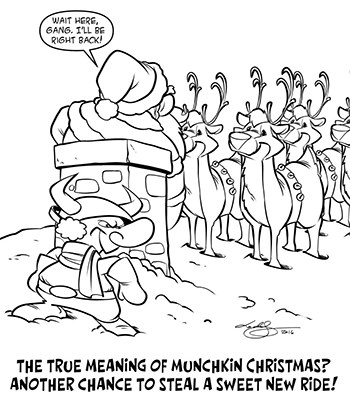 Each of them has contributed their own take on the Munchkin characters, so I asked a few of them what they think the true meaning of Christmas is . . . to a munchkin! The answers were sometimes funny, sometimes heartwarming, and always special. Heck, Lar DeSouza (Super Munchkin Guest Artist Edition) even responded with an original picture (right)! Thanks so much to all of the artists who made 2016, and are making 2017, amazing years for Munchkin!